If you’re looking for more contemporary and nature-inspired places to tie the knot, you’ll love this ethereal Japanese wedding chapel in Kobuchizawa. Designed by Klein Dytham Architecture, the elegant Leaf Chapel was crafted in the shape of two curved leaves—one steel and one glass—that enclose an intimate interior. Delicate lace-like perforations decorate the white steel facade that, like magic, opens on cue when the groom lifts the bride’s veil at the end of the ceremony. 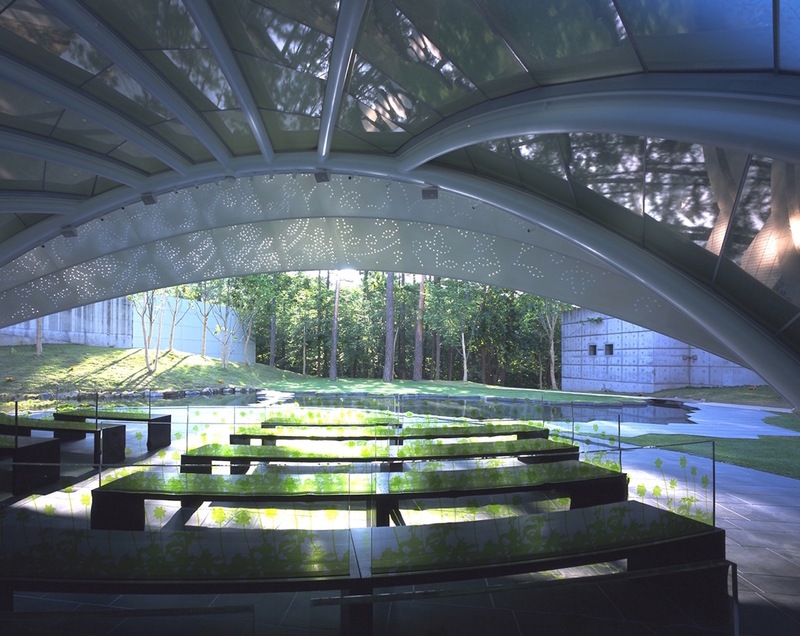 Located on the verdant grounds of the Risonare Resort, the 80-person Leaf Chapel overlooks a manmade pond and views of Mt. Fuji, the southern Japanese Alps, and the Yatsugatake Mountains. The architects built the chapel into a hillside, allowing the glass “leaf” to serve as a curved skylight with a metal framework suggestive of the veins of a leaf. In contrast, the white steel leaf is mostly opaque and extends from the top of the venue down to pond edge. The interior is purposefully kept dark, with black granite floors and blackened timber walls and benches, to keep the focus on the bride and kimono-clad guests. The operable steel facade is perforated with 4,700 clear acrylic holes in a delicate plant motif that resembles a lace bridal veil. The tiny 20-millimeter-wide perforations allow soft dappled light to pass through. 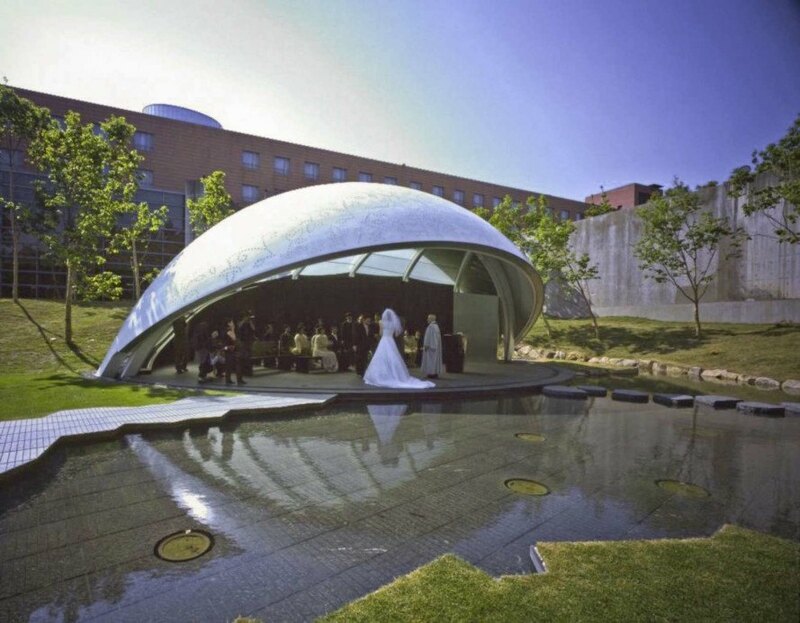 At the end of the ceremony, a cylinder mechanism silently lifts the 11-ton veil-like steel facade in 38 seconds to reveal the beautiful landscape beyond, where stepping stones guide the wedding party out across the pond to an outdoor venue. Nighttime ceremonies can also be held at the Leaf Chapel, which lights up like a glowing lantern in the dark. At the end of the ceremony, a cylinder mechanism silently lifts the 11-ton veil-like steel facade in 38 seconds to reveal the beautiful landscape beyond, where stepping stones guide the wedding party out across the pond to an outdoor venue. In contrast, the white steel leaf is mostly opaque and extends from the top of the venue down to pond edge. The architects built the chapel into a hillside, allowing the glass “leaf” to serve as a curved skylight with a metal framework suggestive of the veins of a leaf. The operable steel facade is perforated with 4,700 clear acrylic holes in a delicate plant motif that resembles a lace bridal veil. Located on the verdant grounds of the Risonare Resort, the 80-person Leaf Chapel overlooks a manmade pond and views of Mt. Fuji, the southern Japanese Alps, and the Yatsugatake Mountains.